Ryan Farquhar is one of the most successful road racers ever to emerge from Northern Ireland. Ryan Farquhar says he is at a crossroads in his storied racing career as Irish national road racing’s most successful ever rider ponders his future. The 40-year-old was seriously injured in a crash at the North West 200 in May during the opening Supertwins race and has spent months recovering from his injuries. Six months on, the multiple Irish roads champion still has a long way to go to regain peak fitness, but the Co Tyrone man isn’t ruling out a return to the sport that almost killed him. Farquhar is keen to continue running his KMR team next year at the North West 200 and Isle of Man TT, and has already received a commitment from one of his long-term sponsors for 2017. In the meantime, the hardened road racer has taken some time to reflect on his achievements throughout an illustrious career. His staggering career statistics have been compiled in full for the first time and Farquhar confesses that his remarkable roll of honour makes for humbling reading. “If there are more wins to be added to my career total, it won’t go up by many. 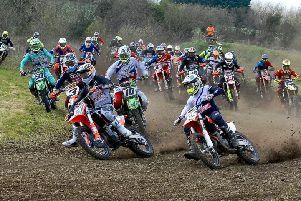 At this minute in time I would like to ride a bike again but I can’t even ride a bicycle at the moment,” Farquhar said. “I’m going for a scan on my left ankle next Monday and hopefully that can be addressed. I’ve no stamina and I’m still very weak as well. “I’ve had a fantastic career and I’m still here to tell the tale, whereas there were a lot of other fantastic road racers who had great careers, but never got the opportunity to sit back and look at what they achieved over their racing lives. “From that point of view, I’m very lucky,” added Farquhar, who retired from the sport in 2012 before finding himself lured back into the saddle in 2014. “You can count on one hand the number of top riders who here today to be able to look back on their achievements, riders like Phillip McCallen, Adrian Archibald, Ray McCullough and the likes of Steven Cull – there are very few. As for his next move, Farquhar says he will sit down with his hard-working band of helpers to discuss the possibility of running his team again in 2017. “I’m definitely at a crossroads and I don’t know what is next. “At the minute I’m not fit to work at the bikes and I was relying on friends to work on them when I had a couple of bikes out at the Sunflower last month,” he said. “One of my long-term sponsors has committed to me for 2017 but I haven’t spoken to any riders yet. I need to sit down with all the lads that help me out, because without their help I definitely wouldn’t be in a position to do anything. “Long-term, I don’t know. I’d love to be able to get back on Roger Winfield’s Paton again and ride my Supertwin again, but I’m not overly bothered about trying to be competitive on a Superstock bike or a Superbike,” he added. “I’d love to be able to get myself fit enough that I can get back on a bike and have a spin somewhere, but at this moment in time I can’t say whether that will happen or not. Farquhar’s combined career total of race wins and podiums since 1995 amounts to a staggering 646, including 384 wins. He has won five times at the North West 200, nine times at the Ulster Grand Prix and three times at the Isle of Man TT. Farquhar has also won 197 Irish National road races and 108 races at Scarborough. He is also a 10-time winner at the Manx Grand Prix and has no less than 17 wins at the Southern 100.